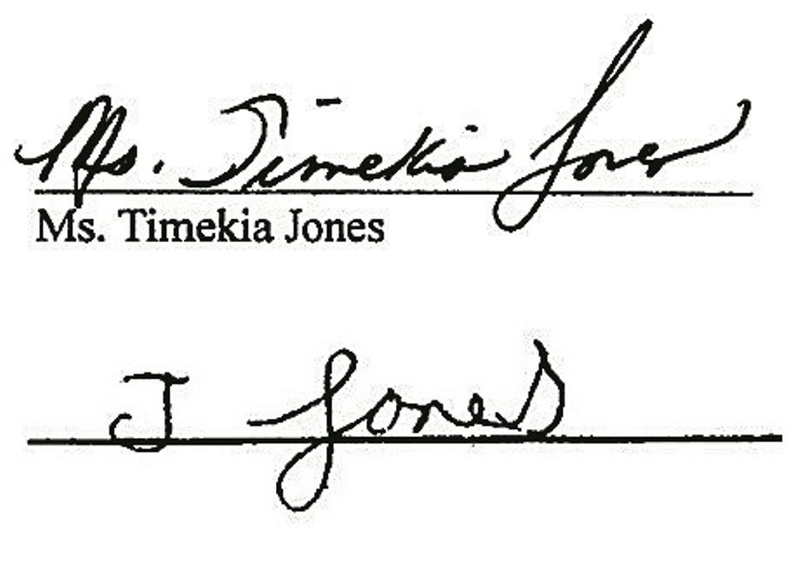 The real signature of Timekia Jones, above, with the signature the Buffalo School District said was “disguised writing,” below. The latest, “latest” controversy surrounding the Buffalo Public Schools is a doozy. It includes a handwriting expert and a curious exoneration by the district of one of its own principals and accusations against a parent. This would be laughable if it weren’t so sad. Not to mention bizarre. This particular case involves the parent who accused Buffalo school officials of forging her signature on key documents. But if the district is to be believed, Timekia R. Jones “forged” her own signature in what they called “disguised writing.” This was done, the district claims, so that Jones could fake her own forgery. Harvey Austin School Principal Brigette Gillespie, who submitted the documents, “was totally removed” from doubt. She’s off the hook. In their efforts to clear themselves, district officials essentially have called into question the honesty and character of an extremely involved and active parent. Jones has been put in the uncomfortable position of having to defend herself against a charge based on questionable science, made by an unidentified “expert.” That’s shameful. Indeed, it’s hard to have much confidence in a district that state Education Commissioner John B. King Jr. once said has a history of “shading the facts” as a way of defending its chronic failures to meet administrative requirements. We hope that isn’t the case here but the situation is opaque. It all started last fall when Jones accused school officials of forging her signature on school planning documents to prove to the state that parents have been involved. Jones said she could not have signed the documents because she was hospitalized on the date she supposedly put her name on Harvey Austin School’s comprehensive education plan. She filed a complaint with the state Education Department and with the U.S. Attorney’s Office alleging that her signature was forged on that and other documents. Jones has been a paid teacher’s aide for the last five years, and has been, by her account, extremely involved as a parent. She told a News reporter that she has undergone training as a parent facilitator, training in “restorative justice” and advocacy training from EPIC, or Every Person Influences Children. And she said she has received numerous awards from the district and Harvey Austin. Jones said she has experienced retaliation since the fiasco began. District officials would surely beg to differ – that is, if they offered anything but a pat statement. Obviously, there is a mystery here and all parties involved, especially Jones, deserve a substantive review, perhaps by an objective third party. At a minimum, the district needs to make itself and the mystery expert available to the public. But that counts for another sad day in the Buffalo School District. You can’t make this stuff up. No, wait. Maybe you can.